Here’s a Right of Publicity fact pattern to kick around: can a company make Pope Francis dolls without a license from the Pope? I don’t know if the recently announced Pope Francis dolls from Bleacher Creatures are licensed or not, so I want to be clear on that point and allow for the possibility that they are. Bleacher Creatures primarily makes 10″ dolls of famous athletes, and they wouldn’t be doing that without permission. In the link below, I find it interesting that the company is said to be “crossing their T’s and dotting their I’s” but the extent of that due diligence appears to be simply that they “reached out to the Vatican” and “would love to officially partner with them.” Taken at face value, that strongly indicates that they do not have any form of permission to make the dolls. Of course, “reaching out” coupled with a statement of desire to “officially partner” is not all that is needed to proceed with commercial products of a famous person. Perhaps the play here is that the Pope isn’t likely to file a claim over it, but last time I checked, “likelihood of getting away with it” was not the legal standard for Right of Publicity infringement. Yesterday brought an important decision from the Ninth Circuit concerning the constitutionality of Washington’s Right of Publicity statute. Overruling the lower district court’s determinations to the contrary, the Ninth Circuit has determined that Washington’s Right of Publicity statute is indeed constitutional as applied to the facts of the Hendrix case. I haven’t had a chance to read the complaint, but author Harper Lee has recently filed a lawsuit against a non-profit in her hometown that actively trades on both her name and elements of her bestselling novel. In the coverage of the story, no mention is made of the Right of Publicity, though this legal doctrine is a central component in disputes like this. Apparently, the museum operates a gift shop–“The Bird’s Nest”–selling various consumer goods relating to her celebrated, and sole, work of authorship. The Museum’s domain name is www.tokillamockingbird.com. Simply because an operation enjoys non-profit status or serves a certain degree of social utility such as a museum does not mean they have carte blanche to use someone’s Right of Publicity or trademarks. Visit http://www.licensing.org to log in and access the article. Happy reading! Last, under Articles, be sure to read the article by Jason Larsen (“So Who Owns the Rights…”), from the Sports & Entertainment Law Section of the North Carolina Bar Association’s publication, The Front Row (posted with permission), as well as my article (“Lessons Learned…”) in that same publication on North Carolina’s recent legislative efforts on the Right of Publicity front. It’s too easy to conclude “buying this knock-off doesn’t hurt anyone.” Follow the $. That’s not exactly the focus of the article on the following link, but that popular sentiment and the serious dangers stemming from counterfeit goods go hand in hand. Two more rulings involving video games came down last week, both from the Ninth Circuit Court of Appeals. 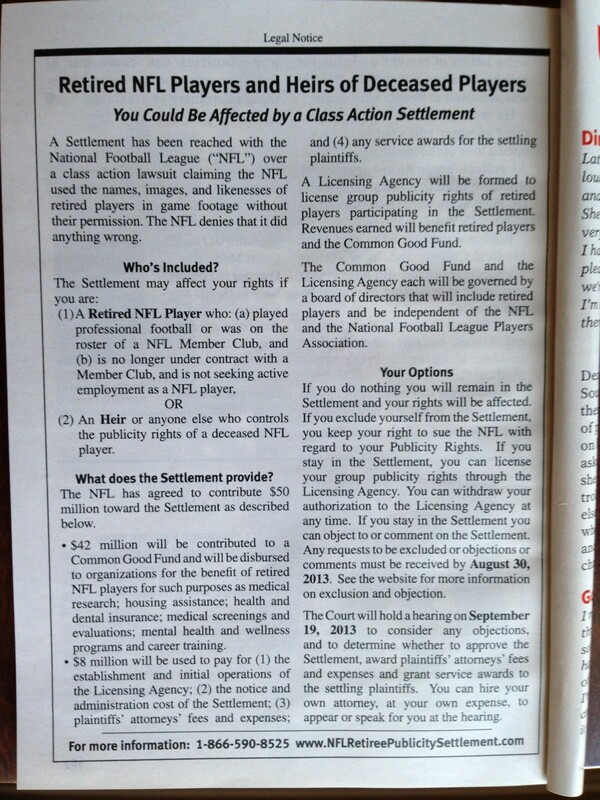 The July 31, 2013 ruling in Jim Brown v. Electronic Arts http://www.edwardswildman.com/files/upload/BrownvEA.PDF determined that Jim Brown’s inclusion in the Madden NFL video game was not an infringement of the Lanham Act §43(a). The court used the now famously misapplied Rogers test to determine that video games rise to the same level as literary works and thus are entitled to equal First Amendment protection. Once committed to the wrong test, the Court held that under the Rogers test Jim Brown’s likeness was artistically relevant to the game, also noting that there were no facts showing that his inclusion misled consumers about his involvement with the game. This point is reinforced by a ruling in another case on the same day, by the same judge, on similar facts but different claims. Specifically, consider the July 31, 2013 ruling by in Sam Keller v. EA and NCAA, No. 10-15387, http://www.edwardswildman.com/files/upload/KellervEA.PDF Here, the Right of Publicity was the claim being considered and the Court distinguished the claims from those in the Jim Brown case. The Court applied the transformative use test, providing a better fit in most Right of Publicity situations than the Rogers test, which was created for application to titles. The ruling was in favor of Plaintiff Sam Keller of course because the objective was to recreate Keller as accurately as possible–the antithesis of a transformative use. Perhaps we have not seen the last of Jim Brown’s claim. The article on this link goes to some length discussing whether the UK recognizes “image rights” or whether this shirts rises to the level of passing off or false endorsement. The reason for this distinction, in part, is related to the legal standards in the UK for these kinds of cases. The recent ruling found Topshop guilty of passing off. Rihanna is suing for $5 million as this article reports. It sounds like while this ruling is in her favor, damages have not yet been assessed. My prediction: settlement is imminent. While settlement is not guaranteed, my experience is that the gamble and expense of pressing on in ligation becomes less and less attractive to a defendant, especially after significant rulings are secured in favor of the plaintiff. It’s always interesting to observe the debate over whether a personality should or should not have a right to take action in response to such unauthorized products. It’s hard to imagine a scenario where a product like this, from a company like Topshop, should be permissible without permission of and compensation to the featured personality. I’m glad the UK court seems to agree. Maybe the UK should look more closely at passing a Right of Publicity or “image rights” law. The notion of “passing off” has worked for Rihanna in this instance, but passing off is not as well-tuned and form-fitting as the Right of Publicity for cases of this nature. The objective of cashing in on Rihanna’s value is apparent and manifest in the product itself. Is there a “greater good” that would be served by allowing a company to appropriate the hard-earned and valuable rights and interests of a personality? Earlier this week, a ruling from the Third Circuit came down in favor of former Rutgers quarterback Ryan Hart in his claim against video game manufacturer Electronic Arts (EA). In short, the ruling concludes that the use of Hart in the NCAA football video game is not transformative. This of course makes perfect sense, as the objective in sports video game programming is to make things as realistic as possible. In other words, the goal is to transform as little as possible. 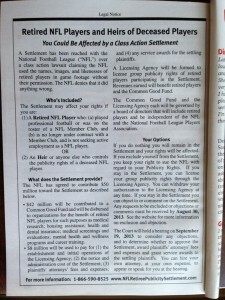 The court also explains in its ruling that the oft-cited Rogers test is not the best fit for the situation presented in Hart’s claim against EA, and confirmed that the First Amendment does not trump the Right of Publicity in a non-transformative, commercial use such as the Right of Publicity. British retailer Topshop has been selling apparel featuring Rihanna’s image, but without her permission. Apparently, Topshop responded to Rihanna’s objections by offering $5,000 and the statement that they don’t care if she approves or not. I like Rihanna’s chances in this lawsuit. Interesting article in today’s The Hollywood Reporter. The article considers the two persons believed to be behind the Boston Marathon bombing, and the possibility of a movie depiction of these events. I do not think such a project is actually underway; rather, I understand the article simply to be exploring these compelling questions. The recent film Zero Dark Thirty raises similar, though perhaps not identical issues. For my contribution to the article, I emphasized that I do not expect that the surviving suspect in custody (Dzhokhar Tsarnaev) could stop a movie from being made about him by using a Right of Publicity argument, due to a combining of reasons involving public interest, newsworthiness, Son of Sam provisions, and statutory exemptions for certain kinds of use that appear in most forms of Right of Publicity legislation. When production companies seek out life story rights, it is almost always (in my experience) those in which the blessing or involvement of the family is desired and beneficial to the project overall. There would, of course, be counterpoints, but it is nonetheless a useful starting point in grappling with the question raised by Eriq Gardner in The Hollywood Reporter piece. An effort to enact meaningful Right of Publicity recognition in New York is gaining momentum. It is long overdue. Details to follow when available and appropriate for release. It should be noted that for the better part of the Twentieth Century, New York’s judiciary interpreted New York Civil Law sections 50 and 51 as inclusive of postmortem publicity rights. This means, for example, that at the time of Marilyn Monroe’s death in 1962 New York did indeed recognize such rights (and those rights were capable of passing, and thus did pass, into her estate). There is, therefore, precedent for New York recognizing these rights. It need not be seen as treading into uncharted territory. In advance of the upcoming hearing in the Jimi Hendrix appeal, I have just been informed that the Ninth Circuit has granted and filed the amici brief that RightOfPublicity.com’s Jonathan Faber contributed to on behalf of Luminary Group LLC and its clients. Should be an interesting case to monitor. I am always on watch for legislative developments or new case law concerning the Right of Publicity, but I also find it interesting to consider the path that the Right of Publicity has traveled. The body of case law on the Right of Publicity is some of the most fascinating, and at times colorful, in all of law. When I was working on Indiana’s revised Right of Publicity statute in 2012, one of the points I emphasized to the legislative committee was that neither the revised legislation I was advancing nor the original Indiana Right of Publicity statute sought to create “new” rights. Instead, the statute aimed to codify common law recognition of rights analogous to the Right of Publicity. I recently came across an article in Res Gestae, January /February 2013, Vol. 56, No. 6, entitled Intrusion into privacy… by Neal Eggeson, which exemplifies the point I was making to Indiana’s legislature. The article notes the case Continental Optical Co. v. Reed, 86 N.E.2d 306 (1949), in which the court recognized the tort of appropriation of a lens grinder whose image was used without authorization in an advertisement for a lens manufacturer. The Res Gestae article is not about the Right of Publicity, but this does illuminate how one can pick up the trail of a concept, or store away data that may be useful in the future. Just looking out for the viewers and users of www.RightOfPublicity.com. Every so often, developments in the Right of Publicity universe touch on especially serious topics, like the lawsuit filed this week by an actress in the anti-Islam film Innocence of Muslims (the movie at the center of recent demonstrations and outbreaks of violence in various countries throughout the world). Cindy Lee Garcia’s lawsuit, filed earlier this week in Los Angeles, alleges invasion of privacy and misappropriation of her likeness, among other claims. In other words, her lawsuit touches on the very subject matter that RightOfPublicity.com is devoted to covering. Those familiar with Right of Publicity legislation might wonder, “aren’t films usually an exempted category of works under most Right of Publicity statutes?” Good question, and essentially the same one that my contact at Variety Magazine asked when I was consulted for his coverage of the story. My answer was that extenuating circumstances should be considered in relation to the statutory language, and that the situation demonstrates why blanket exemptions for entire categories of works might not always be a good idea. The exemption, so to speak, should not be allowed to swallow the rule. One might assume that if an actress appears in a movie, she can’t later claim to not know what the movie would be like or how she or the movie would be portrayed. Garcia’s lawsuit alleges that deception was involved whereby her performance was “…changed grotesquely to make it appear that Ms. Garcia voluntarily performed in a hateful anti-Islamic production.” Garcia also alleges that her lines were dubbed into Arabic. She reportedly has received death threats as a result of the film. I would be curious what Garcia’s contract (if there is one) says about the right of the film makers to edit and revise the film, because that could be relevant to the legal analysis of Garcia’s lawsuit. Nevertheless, if there was deception and misrepresentation taking place, she might just have a case for violation of her Right of Publicity. Contracts, as well as statutory exemptions, can occasionally be overridden. We’ve all heard the often-used boardroom adage that “there are no bad ideas” and I can appreciate the usefulness of this notion when brainstorming and problem-solving. But I submit the following that, well, some ideas are indeed bad. The Economic Times has reported that a Mumbai-based metal manufacturer has attempted to register “Tiger Woods” as a trademark. As one would expect, Tiger Woods’ representatives reportedly have filed an opposition to Om Agro Chemicals’ application. In Om Agro’s application, it apparently claims that it developed the idea of seeking Tiger Woods as a trademark for its products in early 2010. Aside from Woods’ extensive collection of registered trademarks, it is noteworthy that the effort to trademark Tiger Woods would be limited not only by Woods’ preexisting portfolio of trademark registrations and common law trademark rights, but also by his Right of Publicity. In fact, even without his trademark arguments, his Right of Publicity ought to be sufficient to stop any products or advertising from taking place using the name Tiger Woods. As such, even if Om Agro could have sneaked its trademark application through to registration, there would be little they could do with it in the marketplace. And frankly, that’s how it should be and serves as a good example of the Right of Publicity in action. That said, because a company with presumably no right to use Tiger Woods’ name, image, likeness or persona in commerce has applied for a trademark registration based on his name, Woods faces the necessity of paying for his legal team to file trademark oppositions. Such is the burden of the famous, I suppose: if a name has value, it must be protected from those who would attempt to take it. Forgive me for the unusual structure of this posting, but I thought it would be of interest to post the press release that issued following Governor Mitch Daniels’ signing of the Right of Publicity bill that I authored and testified in defense of in January, 2012, at the Indiana State House. Indianapolis, IN— Now that House Enrolled Act 1258 has been signed into law by Governor Mitch Daniels, Indiana has preserved the spirit and intent behind Indiana’s Right of Publicity law and maintained its position as a leader in Right of Publicity recognition, according to Jonathan Faber, founder and CEO of Luminary Group. Luminary Group is a licensing and intellectual property management company that represents icons such as Babe Ruth, Vince Lombardi, and Jesse Owens. Faber, a 1999 graduate of Indiana University Robert H. McKinney School of Law, authored, testified in support of, and defended HEA 1258. He teaches “The Right of Publicity” at the law school and also is an intellectual property attorney with McNeely Stephenson Thopy & Harrold in Shelbyville, Ind. “Indiana’s Right of Publicity law was enacted in 1994 on the strength of testimony from James Dean’s family and Ryan White’s mother,” said Faber. “Since then, it was widely understood that Indiana’s law would protect the rights of those who died before 1994, since the rights existed at common law and the statute simply codified those rights.” Nevertheless, a 2011 non-binding judicial ruling in Indiana last year concerning use of John Dillinger in a video game threw this into question. Faber is the creator of the online Right of Publicity resource, www.RightOfPublicity.com. He also teaches “Licensing Intellectual Property” at the IU Maurer School of Law. Faber has served as an expert witness in cases involving Uma Thurman, Motley Crue founding member Nikki Sixx, the animated character Madeline, and NASCAR driver Robby Gordon. In fall 2011, Faber testified in support of Zooey Deschanel in her claim against Kohl’s Department stores and designer Steven Madden. Earlier this month, Faber and Luminary Group performed a valuation of Indiana native coach John Wooden’s estate. To reach Faber for interviews and additional comments, call 317-428-5441. With an enrollment of more than 1,000 students, IU McKinney School of Law is the largest law school in the state of Indiana. Occupying a spacious, new, technologically advanced building, the school is located in the heart of downtown Indianapolis, Indiana. The school has enjoyed great success for more than 100 years in preparing students for legal careers. The success of the school is evidenced by the prominent positions graduates have obtained in the judiciary and other branches of government, business, positions of civic leadership, and law practice. The school’s 10,000 alumni are located in every state in the nation and several foreign countries. More information about the law school is available at indylaw.indiana.edu. I have little doubt that Facebook’s new “Expanded Premium Ad,” as discussed by Facebook’s David Fischer at AdWeek a few weeks ago, has been vetted and tested from almost every technological and business angle conceivable. I have to wonder, though, if anyone has considered the Right of Publicity violations which may be inherent in their anticipated advertising scheme. The idea, as described by David Fischer at Advertising Week in October, is fairly simple and “doesn”t look that interesting” as Fischer stated in his presentation. Basically, when a Facebook user “likes” a company or product on Facebook, Facebook will insert a line of text into an advertisement on the side of the screen stating “[Your Friend”s Name] likes [this product, movie, company, etc. ],” with an image of your friend next to the text in the advertisement. Sounds like an effective method of target advertising, with your friends” image and a statement that he or she likes the advertised company, right? A resounding endorsement from a trusted source! What appears to be overlooked in all of this are the Right of Publicity implications. In typical Right of Publicity analysis, if a person”s name, image or likeness is used without permission in a commercial manner such as advertising, then an infringement probably has occurred. Furthermore, by communicating that “[your friend”s name] likes this company,” potential false endorsement overtones may also emerge. Facebook has flirted with this advertising model before. I recall a vigorous discussion in my Right of Publicity class at Indiana University School of Law – Indianapolis a few years ago discussing a similar Facebook advertising plan, though my recollection is that Facebook aborted the plan very quickly. At the time, I thought it might have been because of the very issues touched upon here. Apparently not since the plans seem to be reemerging. I”m not sure there”s much difference, at least legally speaking, between the prior iteration and the one that is being contemplated now by Facebook. Facebook might be relying on their existing user agreement, or may be intending to roll out a new user agreement which most people admit to not reading, in order to secure what Facebook might describe as “permission.” I”m not so sure that would be enforceable, though, as a basis to purposefully and proactively utilize a person”s Right of Publicity in conjunction with third-party companies. Right of Publicity agreements to use a person in a commercial manner such as advertising typically involve specific contractual terms governing the use. I question whether a unilateral, non-negotiated, mandatory click-through agreement can substitute for a license to commercialize a person”s Right of Publicity. Facebook could be starting a Right of Publicity firestorm. In light of Facebook”s “Expanded Premium Ad” scheme, I suppose a Facebook user would be well-advised not to “Like” anything on Facebook unless you”re okay with that one unassuming click constituting a Right of Publicity and endorsement agreement for Facebook and that company to use your name, image and likeness in advertising any way that it sees fit. If you happen to be a famous athlete, actor or actress, musician using Facebook, the perils only increase. Consider just one scenario that comes to mind: imagine if a musician, Johnny Rockstar, under contract for the endorsement of a specific guitar manufacturer (company A), casually “likes” a company that makes all kinds of other gear (company B), but also happens to sell a competing line of guitars. Is that musician in breach of contract for “liking” a company that makes a guitar string or other accessory he likes, once Facebook launches its “Expanded Premium Ad” and runs advertisements with his picture next to his declaration that “Johnny Rockstar likes Company B?” Think it couldn”t happen? But one doesn”t have to be famous for this new Facebook “Expanded Premium Ad” to implicate the average Facebook user”s Right of Publicity. The prevailing view, barring other factors, is that every person possesses a Right of Publicity. The reality is that a private citizen usually doesn”t extract much value from his or her Right of Publicity because companies and advertisers generally only seek out, and pay for, associations with widely-recognized personalities (i.e., celebrities, athletes, etc.). This new Facebook advertising scheme turns that dynamic on its head, because now basically every Facebook user will be sought out and included into advertising campaigns. It will be interesting to see how this issue develops. Brando Enterprises, the entity that owns and administers Marlon Brando’s Right of Publicity and other intellectual property interests, has filed a lawsuit against Harley Davidson as reported by Forbes.com and various other sources. The suit centers on Harley Davidson’s offering of a line of boots reportedly entitled “Brando” boots. The suit, filed in Los Angeles County Superior Court, notes that Harley Davidson’s product resembles boots worn by Marlon Brando in his film “The Wild One,” released in 1953. It is not clear at this stage whether Harley Davidson used any other aspects of Brando’s identity in conjunction with the product line, or advertising and promotion of the boots. Over the years, I’ve seen quite a few situations where a company used only a single name in association with a product line, such as a line that has a “Marilyn” style purse, dress, fragrance or other product. All things being equal, the name “Marilyn” conceivably could refer to anyone with that namesake, or no one in particular. But sometimes, upon closer inspection, the product line is being positioned as a “Hollywood” line or something similar, and includes products featuring other movie stars who may be identifiable on a first-name only basis. Similarly, I have seen product lines where the only aspect of identity is a single name, but the product is part of a package offering in which there is not only a “Brando” but also a “Bogart” and a “McQueen” for example. In these scenarios, it would be hard for the company to argue that they were not tying the product specifically to Marilyn Monroe (in the former example) or Marlon Brando, Humphrey Bogart and Steve McQueen (in the latter example). In context, the identity of these particular personalities becomes unequivocally identifiable. In class, I sometimes demonstrate this point through a hypothetical company that has a product referred to as “Michael.” Common name, and likely no particular association is conjured without more context. But, if that product happens to be specific to basketball, might the product be playing off of the consumer’s familiarity (consciously or subconsciously) with Michael Jordan? What if the product features only Chicago Bulls’ team colors? Or what if the product incorporates Michael Jordan’s jersey number in some fashion? What if the product is sold primarily in Chicago? Switching gears, what if the product is music-related? That would likely eliminate any association to Michael Jordan, but may bring into play another singularly-famous Michael. What if the product is a microphone or a style of clothing that is strongly associated with Michael Jackson? I’m leaving these scenarios purposefully vague, and not taking a position myself, but hopefully these examples give something to consider. At this point, I have not investigated the Harley Davidson product line, so I do not know if the two preceding paragraphs are applicable to Brando Enterprises’ suit against Harley Davidson. I will note that the lawsuit alleges that Brando Enterprises has licensed use of Brando’s name to entities like Triumph motorcycles and Dolce & Gabbana, which means that an unlicensed Brando boot from a notable motorcycle manufacturer could not only present the issue and damages of an unlicensed product, but could also be undermining or conflicting with existing programs that Brando Enterprises has in place with its licensees. The band No Doubt has secured a significant ruling against video game publisher Activision. The ruling also appears to send a clear message to the video game industry that video games are indeed commercial products, are not entitled to right of publicity exemptions, and are not to be afforded special First Amendment treatment. Video games would seem to be a prime example of why the right of publicity exists in the first place. Nevermind the long-standing course of conduct whereby video game companies routinely have secured permission and licensed the use of third-party intellectual property in its games; if a video game is not a commercial product, and is exempt from right of publicity liability when a person is included in the game’s content and programming, one would have to wonder why the right of publicity exists at all. This ruling gives some assurance that the video game industry is not going to secure the sweeping shield from right of publicity compliance that it has been seeking. No Doubt licensed Activision for inclusion in its popular Rock Band video game subject to specific limitations in the license agreement. The use of the band went beyond the contractual allowances, and allowed users to unlock features and manipulate the No Doubt avatars into performing songs that were not approved by the band, among other things. It would seem like this claim was really just a contract dispute at its core. If the contract precisely defined how the band could be included in the video game, then anything that goes beyond those parameters would seem to exceed, and thus breach, the license agreement. Activision asserted that No Doubt’s claim was barred by the First Amendment, and that the use was sufficiently transformative (under the Comedy III decision) and therefore not a violation of the band members’ right of publicity. The Court disagreed, and added that the band did not need to show that the use was “explicitly misleading” in order to support its unfair competition claim. The video game industry would like to believe that its commercial products should be exempt under right of publicity legislation, receiving the same treatment as books or news reporting. This ruling, at least, would seem to indicate that the Courts aren’t buying the video game industry’s view. In yet another ruling concerning video games, the likenesses of notable athletes, and the NCAA, a California judge has rejected Electronic Art’s motion to dismiss a claim brought by former NCAA football player Sam Keller. It should be noted that this is not a final disposition on the case overall, but rather is an interim ruling that allows Keller’s case to move forward. It may, however, be a strong indicator of how the court will ultimately decide issues concerning liability and the defenses EA is likely to advance. The lawsuit centers on the use by EA of Keller EA’s NCAA Football video game. In an effort to support its motion to dismiss, EA argued that its use of Keller’s likeness was not a violation because the use was transformative, and that the use was a matter in the public interest. As for the newsworthy arguement, the court found that the EA use was not merely news reporting, and the video game use was distinguishable from fantasy football games, which have secured certain First Amendment from the courts in recent years.